SO! Let us begin with the basics. What goes into your lasagna? Bolognese + bechamel + Parmesan + noodles = tastiness. You don’t need, contrary to popular belief, mozzarella or ricotta. Of course, these extra blobs of wonderful milk fat don’t hurt anyone (Except maybe your artery friends that are screaming for relief) but they are not necessary components. Traditionally speaking, the Italians put like a pinch of tomato paste in. Minuscule amounts. This is not a tomato sauce with an afterthought of meat pitched in. 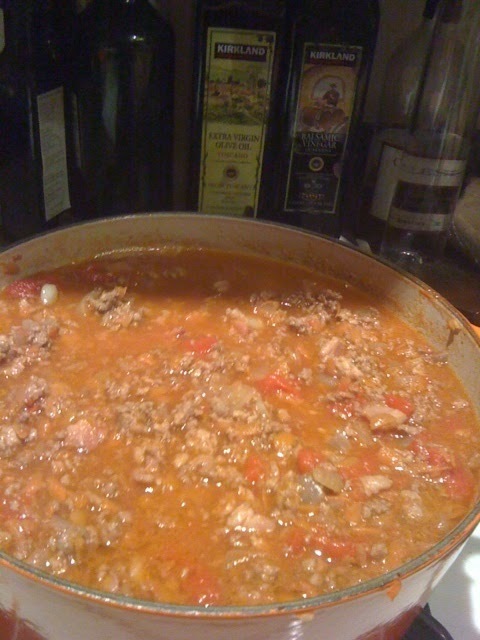 It is a meat sauce with a hint of tomato. The problem is sometimes it can turn out with a little less “sauce” then your average American might hope for. That is why it is essential to simmer for a loooooong time. So simmer it away, go drink a beer, write a poem, play with your gerbil, whatever you feel like doing that takes almost two hours. Feel free to skim off the fat and stir it around, but if you get antsy and want to get the ball rolling sooner, your lasagna is not going to get you as many high-fives as you were hoping for. Make the roux with the butter and flour (melt the butter, add the flour and cook over medium heat for about two minutes…this gets rid of any “floury” taste…stir constantly!). Add about 1/2 c milk to the roux and whisk whisk! until smooth. Continue adding the milk slowly. 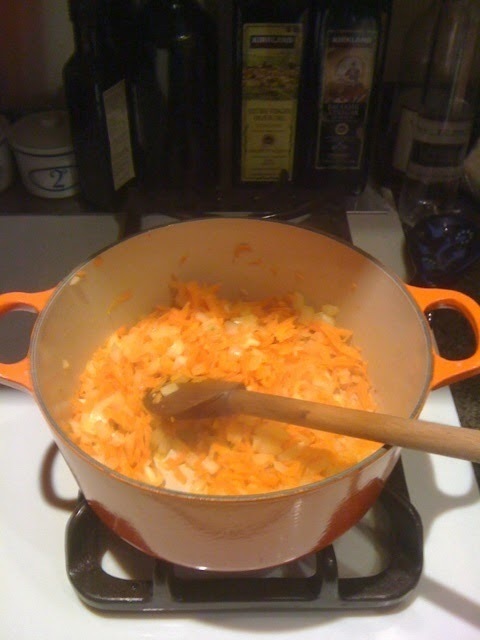 Bring to a simmer (keep stirring, even if your arm is tired. This is no time to be a wuss) and add the garlic, S, P, and nutmeg. The sauce should be thicker by now, so you can turn off the heat and let it cool for a bit. Now it’s hammer time! Preheat your oven to 375. For the last Act you shall need 16 lasagna sheets (barilla makes a “no boil” kind. There really is no reason to boil them first, it just makes life harder for you!) and about 1 c grated Parmesan cheese. You will get four layers (16 sheets of pasta come in one box) and a very full pan. I recommend placing the dish on a baking sheet to catch any overflow. Mmmmmm yum. Pop it in the oven for 45-60 minutes, or until bubbly. If the top gets too brown cover with tin foil. Now of COURSE the instinct will be to dive in, face first, and burn your skin off in a fit of culinary ecstasy. But you shouldn’t. You mustn’t. Lasagna is so so so so SO much better the next day. The flavors meld, they get a chance to know each other, and the delicious just goes off the charts. So I beg you, don’t touch it. …but enjoy it when you do!